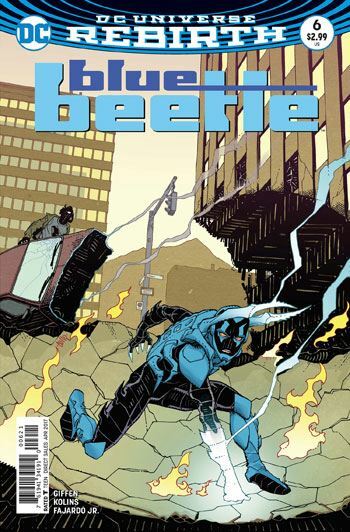 Blue Beetle 6 continues to unravel the mystery behind the scarab that has attached itself to Jaime Reyes, but the hero gets very little good news in this issue. 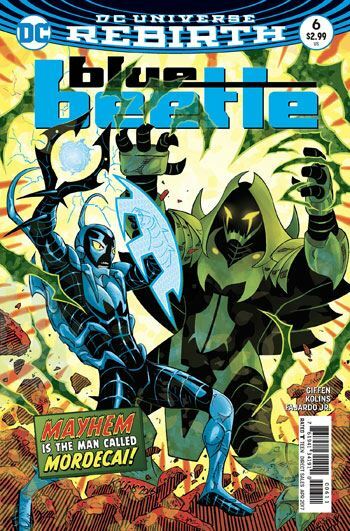 It’s not quite as much fun as some of the earlier issues, although Keith Giffen’s dialogue still sparkles. And Scot Kolins’ art is very strong, and perfectly suited to this series. Ted Kord and Jaime’s mother share some information with Jaime about the likelihood of removing the scarab from his body, but it’s not the news he wants to hear. It’s hard not to feel really sorry for the boy, as his troubles just get worse and worse each issue. Mind you, there is a fair amount of misery going around in this story, as Paco’s homelife is shown to be far from ideal. Some more information is revealed as Dan Garrett as well. And the Dr. Fate subplot moves forward. Perhaps this storyline could be moving a little more quickly, but it’s not like the tale is dragging at all. The time gets spent on the emotional states of Jaime and his supporting cast, which functions well to raise the stakes and make the events of the story hold more weight.